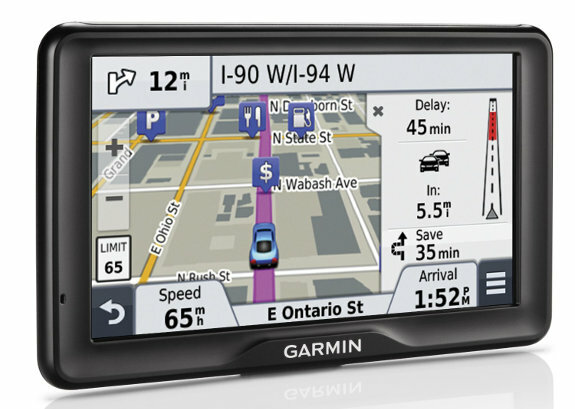 The Garmin nüvi 2797LMT is the company’s first 7″ navigator outside of their dezl line for truckers. As a matter of fact, the hardware seems identical to the dezl 760LMT (although the dezl does have a different mount). The 2797LMT is also the top-of-the-line model in Garmin’s 2013 Advanced series. Improvements in this year’s models include active lane guidance, traffic announcements, “Real Directions” and the slide-out Up Ahead feature. I’ll explore each of those features in more detail below. As a high-end model, the 2797LMT includes maps of the US, Canada and Mexico, as well as lifetime traffic and map updates, Bluetooth for hands-free calling and voice command. UPDATE: Here’s a feature I initially missed — it turns out that all 2013 nuvi LMT and LT models have ad-free traffic. To see how the 2797LMT stacks up against other models, check out my Garmin nuvi comparison chart. Below you can see three nuvis for size comparison — the 7″ 2797LMT, the 5″ 2597LMT and the 4.3″ 2495LMT. Seven-inches makes for a big navigator. It didn’t overwhelm my Honda Accord, but I sure wouldn’t want it in anything smaller, and I don’t think I’d want this for everyday use. But if you have a full-size pickup or a van, this might be a good choice for you. If you have an RV, or anything large enough to worry about bridge clearances, etc., you might want to look at the dezl 760LMT. And while I prefer to use a friction dashboard mount, I found the windshield suction mount to be very secure. I had no trouble with the 7″ 2797LMT mounted using either method. One of nicest new features on the 2013 Advanced and Prestige series nuvis is active lane guidance. There was some concern that this would be inferior to the old lane assist feature, but rest assured, the new one is clearly superior. While it is true that the lane guidance doesn’t always show up in the next maneuver indicator, consider the image below where the vehicle is approaching two different exits. The new system does a much better job at showing which exit to take. Here’s a video I’ve posted showing active lane guidance in action. The 2797LMT will announce “if there is traffic on the route, what the expected delay is and if there is a faster route,” similar to TomTom’s approach. There are settings allowing you to control how frequently you hear such announcements. While I did not do extensive testing in traffic, I did hear the unit say “light traffic on your route,” with the screen showing “on fastest route” (see image above). Another time it said something to the effect of “there are seven minutes of delay, you are on the fastest route.” I will say that it nailed the incident shown above — both where it started and where it ended. As you can see in the image above, the 2797LMT shows the street you are currently travelling on at the bottom of the screen (unlike previous nuvis) and the next turn at the top of the screen. When you are not actively navigating the top bar shows the next cross street you are approaching. You can see the slide out Up Ahead menu in the screenshot below. Tap one of the icons to get a list of upcoming gas stations, banks/ATMs and restaurants. Unlike last year’s Exit Services feature, this feature alerts you to upcoming POIs on surface street routes as well. The three menu items and their order can be customized by tapping one of the icons and then tapping the wrench icon. Additional options include parking, rest areas, lodging and custom search (for a business name or category). Note the X to close the Up Ahead menu. You open the Up Ahead feature by tapping the menu icon in the bottom right corner of the map screen, and selecting it from the menu shown below. The items shown in this menu can be customized as well. Additional options include detour, brightness and a trip data slide out menu (also customizable from Settings > Map & Vehicle > Map Tools). All seven options can be included if desired. And since the Detour button doesn’t show up on the main menu, I’d suggest adding it here! 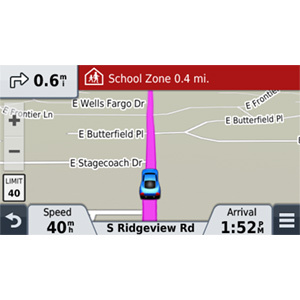 Of course the nuvi 2797LMT covers all the basics, such as calling out street names for turns, lifetime traffic and map updates Additionally, you’ll find trip planner (multi-destination routing), custom avoidances, Where Am I, voice command (which continues to work very well), photo-realistic junction view, route choices, extensive Where To customization options, and trip log. Smartphone Link is now available for iPhones or Android phones, and the detour by road feature is now available when you tap the detour button. Bluetooth sound quality was actually pretty good, much better than on the 2597LMT. The nuvi paired easily with my Samsung Galaxy Nexus and was able to access my phone book and call history. But there seems to be some sort of software bug — while I was able to receive calls I could not to dial out using the nuvi. Since this probably isn’t hardware related, I’m hoping Garmin will quickly fix it. I noticed no routing errors, sluggish performance, lock ups or shut downs during a month of testing the 2797LMT. This 7″ model is a welcome addition to the nuvi line and I’m going to cautiously recommend it. If it wasn’t for the Bluetooth issue I might deem it the best nuvi yet. Hopefully that will be fixed with a firmware update in the near future. In addition to the giant screen, the most notable improvements are active lane guidance, the up ahead feature and traffic announcements. When you tested…did you use your Garmin Friction mount…and if so… everything work out ok? Yes, and it worked fine. Rich – considering the nuvi 2797 LMT. I would prefer to use the friction mount. Any concerns with using the new gel style friction mount and a 7 inch gps? Also ther are two model numbers for the garmin friction mount which one should I use with the 2797? Scott – I transferred my old, obsolete 3590 from the flexible friction mount that Rich prefers and refers to, to my new 2797. It works just fine. I did modify it a bit. I turned the ball mount (goose neck with the ball) around to face the other way. Then I mounted my passport (radar detector) to the mount in front of the 2797. I’m in the habit of placing the GPS and mount on the floor in front of the drivers seat EVERY time I leave the car. That way I keep my GPS’s AND car windows, which are more expensive that the GPS. I bought a TomTom friction mount ( 9UUB.052.06 SKU: 2033136) that is a combination “beanbag” and flexi/sticky mount, and is bigger than the Garmin mount. Thought it would need it. Not. I had the Garmin flexi mount for more than a year when I noticed a fatigue break in the soft aluminum in the sticky gel, all the way across and thru the two mounting screws near the middle of the gel pad. I called Garmin to order another unit knowing it was out of warranty. They sent me another for free, “under warranty”. Nice guys, hope I don’t get anyone in trouble. This mount also folds flat for packing (airplane traveling). Yes, I take it with me, and yes, it works just fine in the window of the airplane, but it makes some people, including stu’s nervous, for some reason. The screen resolution is 800 x 480 px. It looked good to me, but that’s subjective and I didn’t do any testing to compare it to other units besides look at the amount of detail shown on the map. It came with a GTM 36. I haven’t tested the 3597 yet (hope to get one in the next few days), but if I had a big vehicle, I’d be very tempted by the 2797. Could you present some pictures in portrait mode? I think it still exist in new nuvis but I hardly can imagine how all this menus and informations are organized. It does look that way, although it is an image Garmin provided to show active lane guidance. But yes, you are right about the difference. Thanks, I think these are pictures form 2597, not 2595? I wonder where Active Line Guidance or Up Ahead would appear. Yes, the 2597LMT! Thanks for catching that. I’m going to try and post a couple more screenshots in a few minutes. Dont agree completely with your findings. On my 2797 i found the sound quality and volume is mediocre compared to my 1490T. Also, BT connectivity flakey. I can call out but have problems connecting with incoming. I think this more a factor of indiv phones performance characteristics. I use a samsung convoy 660 but also tested my 2797 with a I4S, Galaxy S3 and a Droid Razor , courtesy of my man at Radio Shack. The S3, garmins own recommended phone for the 2797 would not even handshake. The Razor worked the best. Voice command is just ok; i rate it a 75 out of 100, so far. I also find the screen a bit washed out compared to the 1490t but that is prob due to the 5″ vs 7″. Same pixel count over larger area? Might try changing map theme to ‘germany’, looks somewhat like my old 660 with tan background and gray streets. In spite of above, still like the unit as an upgrade to my 1490T. Q: How do you enable the ‘school warning’ flag to display? I have driven past several schools during my testing and no warning bell so far. I think it just depends on whether or not it is in their database. I’ve seen it around some schools and not around others. Did you add other POI software to your unit which included schools? The manual says you can bring up proximity warning via Setting>>>Proximity Alerts, then you choose audio and alert options. Only prob is i dont see the prox alert on my unit after i tap settings. So, where did your red bar come from? Garmin tells me tne prox alert option only displays when you add software such as the safety camera subscription, but they really couldnt explain where the school warning came from. No, I added no custom POIs. The school zone warnings I saw were built-in. Ok, a real puzzle. I have garmin support on the phone and i told them. They say it is tied to additl POI loaded stuff. By the way, their cyclops safetycam file is NOT supported by ANY of the 2013 units, so they said this morning when i tried to load, it failed, so i had to get a refund. Did you test with an off the shelf unit? I assure you they are not posting images like that with custom POIs. Further, they tell me ‘the techs are working on this problem’ and will include the fix in the next firmware update. So reassuring. “The problem” if I had to guess would be the Cyclops Camera Database. I would think that not being able to use their own speed/red light camera database would hurt their sales where a lot of people may be looking to upgrade. The 1490 screen is 480×272=130,560 pixels. The 2797 is 800×480=384,000 pixels, almost 3x as many as the 1490. Just using the diagonal measurement, the 1490 would be 26,112 pixels/inch and the 2797 have 54,857 pixels/inch. Great review, I am debating between this, model, the 2595lmt, or tomtom’s via 1605 tm, in your opinion which model do you think preforms the best in comparison? I have read your reviews on each, wondered if you had any thing to add it making a referral. If Bluetooth is important to you, you might want to go with the 2595. Otherwise I’d choose one of the newer models (the 2597 or 2797). Some people think TomTom traffic is superior, but I’m not sure how valid that is anymore. They are being less than transparent about IQ Routes data collections sources these days, so they may be losing their edge there. Thanks very much for the review Rich, you’ve never let me down! I am very strongly considering moving up from my nuvi 2460LMT for a dezl 760LMT since I also drive a Class A RV. While I have not seen any dezl 760 reviews as in depth as this review on the sibling nuvi 2797LMT, this 2797 review has raised my level of “anticipation” since they are reported to be similar. Do you know if the dezl 760 also incorporates the new features (active lane guidance, traffic announcements, next turn/street, up ahead, etc) the way they are listed here since they are siblings? While we all have our preferences, I really like the display of the current road at the bottom, and the dispay of the next cross street/routing turn at the top. Thanks again. Glad you found it helpful! The dezl 760LMT has active lane guidance, but I don’t believe it has traffic announcements or displays the road you are on. I’m betting the next generation dezl will, but that could be a year away. Thank much Rich. Bummer… but I still thank you the messenger. The comparison screnshots of the map on the 2797 vs 2597 are very interesting. They really do imply that Garmin is putting the extra screen real estate to use by displaying more of the map. But 3d view can be hard to compare since there’s no scale indicator. If you switch to 2d mode and zoom both devices to .3 miles (for example), does the 2797 still show more of the map? Does the US firmware allow you to disable auto zoom (other recent models only allow this if you choose another country during setup, like Australia). Also, when using 2d mode with map detail set to the highest level, at what scale do the small roads disappear? This would happen at 1.2 miles on older nuvi’s, but starting with the 1xx0 models it became .5 miles. Little roads disappear at .5 miles on my 3790. But playing with a 3490 in the store, I believe it was 1.2 miles. 0.3 miles for neighborhood streets. Then I lose about everything but Interstates at 1.2 miles. Same for both devices. Sorry, I didn’t have it set for Most Detail. After changing the setting, I lose smaller streets at 0.8 miles on each device, but can still see many numbered highways. At 1.2 miles I lose everything but Interstates (and the Blue Ridge Parkway!). Thanks Boyd! There is very little difference once I switch to 2D. In the screenshot I’m posting with this comment, the 7″ model adds another road name but loses the I-75 label! I was careful to choose the same zoom level for the 3D comparison shots (each device had 10 steps in the 3D zoom). And I don’t see a setting for disabling auto-zoom. Thanks a lot for taking the time to post those Rich! But… (sigh)… it’s business as usual at Garmin. This is exactly what I’ve seen on older models – Garmin has decided how much of the map you should see at each zoom level, regardless of the physical screen size. I guess that makes sense if you are only buying a larger device so that you can mount it farther away. And that is probably the majority of the audience for a big screen device. Thank you for an exceedingly helpful review. Here’s my issue — I have tracks previously recorded with another GPS that I had uploaded and saved in Garmin Connect and Base Camp. I now want to transfer or upload these tracks to my Nuvi 2797lmt. When I clicked “send to device” in Garmin Connect, I received a message that these tracks were successfully transferred to the Nuvi 2797lmt. Great! But now I can’t find the tracks anywhere on the Nuvi. Where are they hiding? How to I do locate them? Your help is appreciated. Nuvis won’t accept tracks, but if it’s a route you sent, look (from the main menu) under Apps > Trip Planner. It will accept waypoint and route .gpx files, but not tracks. There are tools to convert a track to a route though. Converting a track to a route will likely make a mess of it. Tracks can contain 10,000 points and routes only about 200 points. For the Nuvi, there are two programs you could look at however. They will convert a track to a *map* with a transparent background. So you can send this map to your Nuvi and it will overlay your track on the built-in map. This is not as simple as actually sending a track, but it’s probably the best compromise for the Nuvi as there’s no limit to the number of points or distance of your track. Boyd, you are a godsend to tell me I must convert the tracks to a map with a transparent background. I downloaded gpx2img and chose BaseCamp when asked. BUT the instructions and tutorial videos for gpx2img are designed for MapSource. (The first video demo uses BaseCamp, but the second more significant video and the instructions are solely in MapSource). So I downloaded MapSource. But there are NO maps on my MapSource. Indeed, the field in the ToolBar “Select Your Map Product” with dropdown box is MISSING from my tool bar. I read in the gpx2img:Manual: “If using GPX2IMG without Garmin Mapsource installed on your computer, the first time you launch GPX2IMG you will be asked to choose a directory to generate your IMG files into.” I choose BaseCamp — but frankly I don’t see the relevance when my MapSource tool bar is missing the significant “Select Your Map Product” field. Very frustrating. I have dozens of tracks I want to load to the Nuvi. I’m at a road block. Did you notice any problems with brightness when viewing with polarized sunglasses. I just returned a 3590LMT as the screen almost disappeared when I first used it, and found it to be a problem with screen polarization. Found with all sunglasses tested (4 diff pairs) the best view-ability was if it was rotated 55 deg clockwise from level!! No. Perhaps my glases aren’t polarized. Did you try putting it in portrait mode? Yes, and it was brighter in portrait mode (more usable) than landscape. I then checked my 2595LMT and it was only 15deg off and has a much wider rotation for viewing, but dimmer in portrait mode. The 3590 has the newer capacitive touch screen (gestures) and suffers from a lot more glare. I,m not sure garmin is checking polarization of the supplied displays on the newer units. My 1450 seems to not have this problem. The 1450 also has much better view-ability. Newer units (5 inch) are much “softer”/lower contrast/not as crisp and not near as bright when measured with a light meter. Under controlled conditions about 25% less. I dropped and broke my old analog meter in the process. Seems like the 2013 models have decreased in price, even the 3597 that just came out is down $30. Amazon and Garmin website have 3597 at $350 down from $380. Yeah, I saw that the price has dropped. Much faster than I would have thought. Shopnbc reduced their price, this week, by $30, from the orig $299, which also includes a ‘beanbag’ mount. Funny thing is they list the 2797 twice, once at orig price and again at reduced price. Caveat Emptor. Your review of the nuvi 2797 lmt says the hardware seems identical to the dezl 760. The dezl 760 boasts a “larger” speaker in order to be heard in the louder truck environment. Do you know if the nuvi 2797 has this larger speaker as well? I like the idea of a bigger speaker (and the headphone jack) of the dezl model, but prefer the features of the nuvi 2797 (up to 100 routes, garmin talk). I drive a LOUD deisel school bus, and my regular garmin nuvi cannot be easily heard. (Too weak of a speaker). Sure wish garmin put out a nuvi model with the larger speaker and headphone jack. Any info on this? (May have to choose the desl 760 simply due to the speaker and headohone jack)….but really like the nuvi 2797. I find the 2797 speaker very loud compared to any other nuvi I used, including its predecessor the 1490t. I get a lot of road noise with my Subaru especially on some of the roads here in NYC metro area and I have the unit on 60% which is plenty loud even over the Mikado CD. Should work for you. Does the POI section include campsites? If no, could one downlaod these from such sites as Archie? Yes — Where To > Categories > Lodging > Camps & RV Parks. How comprehensive will likely vary by region. You can load a custom POI file using Garmin POI loader. I have only used Tom Tom and Navman devices here in Sydney, Australia. With Garmin does it give you any choice or various route options to get to your destination. Because with tom tom and navman before you press Go/Done – it will display Two/Three ways you can click on to get you to your destination. I have Not seen this on garmin. And i dont really want to fiddle around typing in waypoints or going into different sub-screen pages to see other routes to get there, So do you know if there are options for other ways to get to your destination that pop up in the beginning before you have to press go? Rgds from DownUnder in Australia. Yes. On the latest models tap Where To, your destination and then Routes. Hi, I want to thank you for the review, I’ll be buying this based on this awesome and informative review. Are you associated with any site so I can purchase from them? If so I would love to buy from them. Thanks Michael. Glad you found it helpful. All the sources listed at the end of the article will give me a commission if you buy through those links. Check out the lane assist/junction view image on Page 5 of the nuvi 2797 manual. The problem is similar to the one you and your wife had on a recent trip. I think someone didn’t proof read the manual. Ha! Nice! Thanks for sharing. Very helpful review indeed, thanks. Not having owned a Garmin unit before, I’d like to check something I haven’t been able to confirm: Does this unit (or other current Garmin model) automatically turn itself off after either no movement for an amount of time or after the power source is disconnected/switched off? Yes. It will go into sleep mode when external power is lost. The battery can last on sleep mode for several weeks. Good question about whether 2797 will turn off auto if no movement after a period of time. I don’t think so as long as connected to live power, ie car ignition stays on. After using 2797 for months now, must say the ‘sleep mode’ feature is great. When powering on, unit acquires satellites and BT and is ready to go usually immediately with no ‘wait’. Thanks Rich and Michael. Just what I was after. Hi Rich, I have been to the retail stores and had various tries of the 2797. However (possibly due to in-store and no signal etc Only simulation mode), I have not had any success trying to see how you can plot for example 5 mulitple different destinations and let the 2797 work it out & sort out the correct running order itself. 1. Can you punch into the 2797 mutiple destinations in the beginning before pressing Go/Done ? 2. What is the exact steps to enter this in ? I have tried so many times and different ways to look at multiple destinations (in ONE HIT) and i can’t see it & do NOT think the device can do it ???? Thanks if any help on this – From Mike (Sydney, Australia). From the main menu, use Apps > Trip Planner. AFAIK, there is no auto-zoom setting on the 2013 nuvis. I checked other ones before and I just checked the 2497LMT. I’m trying to decide between the Nuvi 2797, and the 3797. Any recommendations? I like the 7″ screen on the 2797, but think I would like guidance 3.0 & HD traffic on the 3797. How about the 2797LMT and then buying the GTM 60 HD traffic receiver accessory? EASE of USE: i am simple enough that i choose not to use a smart phone_confusing at best and i hate pushing buttons. With that in mind, i am planning to hit the road in my big chevy. It is either van or relive my 70’s youth and hitch hike. Would like your comparison between the G 3590LMT as compared to this one. Any MAJOR diffs i should be aware of? Yes, i wear poloraized galsses. Hate to say this but despite my glasses strength, i can not read highway signs ahead at 45mph. Hence, i have been hesitant to drive highways. Do either of these garmins alow you to choose alternate non highway routes? I dont mind a slow ride.. Also (sorry for so many Q’s) is there and option to add truck stops as POI’s OR do “rest stops” include truck stops? . I would go for the truck models but i have heard some lost truckers out there where alternate routes included weight stations they preferred to avoid but did NOT prenotify. Any word on this a god send, thanks~ KG. Also hoping these gamins take into account a hightop van_nothing worse thatn seeing a parking lot has a low overhead. You should certainly be able to enter the vehicle’s height in the RV 760LMT. Great reviews Rich. Probably the best comprehensive GPS review site that I’ve seen on the net. I look at Amazon reviews and reviews from other sites as well… but none of them are as in-depth and cover so many areas as comprehensively as what’s found here. I notice on the Garmin site they “officially” recommend the beanbag type for the 2797 but not the other “sticky” one. Personally I think the “sticky one” might be better overall just from what I’ve read about it but the dash in the Intrepid is a little uneven/sloped so I’m not sure which would actually be best. I’d have to order online as there’s nothing available locally to try them out. It’s probably 50-50 and both would likely work fine but I’m just wondering which one you think might be best for a wider range of surfaces as well… in case I use the 2797 in another vehicle as well. Is one of those mounts more “adaptable” to a greater number and types of surfaces? Again… fantastic site and great to find it as this will be my 1st GPS and mount purchase and this makes the process of choosing the best combo much easier. I like the sticky style better. The bottom of the bean bag tends to wear over time, resulting in it sliding around on the dash. From the Map screen, tap the (three horizontal line) Menu icon, then Trip Data. Tap a data field and select Elevation. I currently use my 5-year old Garmin unit primarily for traffic info. I just leave the unit on all the time (since it takes 15 minutes to get traffic data once I turn it on), and leave it on the traffic map, which shows the congestion on the freeway system. Does the 2797 have a dedicated full-screen traffic map, or does it just show traffic on a split-screen? Do you know how long it would take the 2797 to obtain traffic info from a cold start? Also, can one use voice commands to mute and un-mute the sound? Let me add my thanks to the other folks who have posted theirs on this site. I don’t think I have ever seen such a responsive reviewer! I don’t know if there is a traffic overview map or not. You can mute/unmute with voice command. You may get faster traffic info with an HD GTM-60 traffic receiver. Hope this helps. Rich, great review! The boss purchased this model after I recommended it and now I’m stuck learning it so she can enjoy it. 2 quick question on trip log…. b) If the boss is going on a 2 week camping trip way the hell in bush country, will this Nuvi 2797 be able to store the trip (track?) log so that she can get back (to civilization)??? Any tips on this particular aspect would be VERY HELPFUL! If the boss goes camping to a new offroad site, does it make sense to save waypoints (specific areas) along the way — say every 10 minutes or so?? Then once she reaches her offroad destination, is it practical to now use the Trip Planner using these same previously SAVED locations to get back to civilization?? Is the Nuvi intelligent enough to use these saved waypoints in conjunction with the trip log?? Or, does the Nuvi say, “Um, I don’t SEE any roads so screw you pal!”?? No, you cannot follow the trip log and you cannot navigate to waypoints very well if there are no roads. Sounds like you need a handheld GPS instead of an auto unit. Ok thanks for the reply, Rick! But can she also use the triplog to go back in the opposite direction? How do you tell the Nuvi 2797 to do this? Is that what the “Where I’ve been” app is for? I see various the tracks (trip log) but I don’t see an option to ‘go back.’ Perhaps I’m missing something that’s right in front of me. There is no go back option. The only way to follow the trip log is to do it visually. With a handheld GPS you can navigate the trip log (AKA track). Where are you seeing Trip A & Trip B? Yikes! Her, family and some friends who flew in from the MidWest left on another long camping trip. And I told her to take the Acer netbook with BaseCamp installed so she can import the trip log and create routes of them. “No room, we’re overloaded” she says. LOL! They left yesterday to go up to Lake Turkana (North Eastern Kenya) by the Ethiopian border. That’s why I was hoping to get a quicker reply. I got her to buy the Tracks4Africa map so we’ll see how good the October 2013 edition is for that remote region. I’ll know in 2 weeks when they return — hopefully. LOL! She’s a trooper anyways! She hiked down to East Africa in the 1970s via Europe & North Africa after graduating from University of Kansas…only goes back to the US for holidays…never to live. Trip A & Trip B are shown (if I can remember since the boss is gone with the Nuvi into the bush!) is after you start a trip in the Trip Planner…it shows up with odometer readings. But I don’t know which reading is for what trip. Is Trip A the current trip statistics? Then what does Trip B constitute. The only place I see trip A & trip B is on my trip computer screen, where they can be reset independently — its just an odometer. BTW, she also owns a Nuvi 750. She went up by Lake Turkana a few months back and the trip log FAILED her because it would OVERWRITE previous entries after a while. Memory limit?? Does it have a cross street function? like if you want to go to to a junction of two streets? I have just bought the 2597LMT after a disappointing experience with TomTom, but one thing that I could do with Tom Tom was be able to switch off voice navigation and still be able to hear audible speed and camera warnings. I have looked for this in 2597 but no success, can anyone advise on this please? Not that I know of, but you could try zeroing out the navigation in the volume mixer. Will the powered mount play nice with an aftermarket ball mount? I want to use a ball mount that will attach to the back of the tachometer on my MINI so that it will be high enough to be in my line of sight but low enough that it won’t eat half the windshield. The 3590 worked perfectly this way on a previous (stolen!) MINI. Interesting that you can add TomTom traffic to this through the GTM-60 and the Clear Channel HD subscription. It covers more roads than the Navteq HD traffic. OFFTHEGRID – please elaborate on how you made this connection for those of us not familiar with TomTom, Clear Channel or GTM-60!! THANKS!! Just purchased the Garmin 2797LMT and in perusing its features have not found a pedestrian mode like our earlier 5-inch screen Garmin. What’s up with that? Our older model was useful for touring large cities on foot. Is there a special app to download, or was this (useful) feature just eliminated in this model? If so, I’m probably going to turn in the 2797 for a refund and shop around. NOTICE -A BUG in the 2797. I had my 2797 for about a week, everything working well, until it went dark all of a sudden driving in Atlanta traffic. I readjusted the screen brightness and in less than 60 seconds it went dark again, several times, from 100% to 10% brightness, just barely visible. I called Garmin CS and they were familiar with the symptoms and had me set the TIME RESET to AUTOMATIC, which cured the problem. Does the 2797 allow you to zoom in and out by using voice command? Kevin, I could not make my 2797 zoom by voice commands, nor do I see that command listed. Maybe I’m not doing it right, I very seldom use VC. Call Garmin customer service (913-397-8200), see what they say. Just ordered a refurbished 2797lmt and am wondering if there’s an easy way of transferring favorites from my Zumo, or do I have to do it manually, one at a time? Stumbled across your site while researching gps units. I am leaning towards the nuvi 2797LMT. Do the nuvi devices with HD in the name load maps faster compared to an LMT only device? Lastly, could you do a preliminary review on the upcoming nuvi 2789LMT? Is it possible for the Garim Nuvi 2797LMT to show a compass direction heading (N, E, S, W, etc.) like the older Garmin units do? have always for year bought Garmin…. My latest is the Nuvi 2979LM. I got it because or the Bluetooth as I am a technician and always in and out of my service truck. I get calls a lot bein on road wether the shop or Customers. and being that its illegal and just not safe to drive and use cell phones. anyway. everything “works” great…. everytime I walk away from my truck and come back to it. I have a 2 minute game of going to Bluetooth setting and click OFF my cell phone…then click OK…..
then click back on my cell phone. first time.. no go . 2nd time if Im loucky it might go or a lot of time it will “say” connected . but phone icon will not be on. then I have ti go thou THE WHOLE PROCESS AGAIN. I did call in and was told they were mainly for I phones….guess what. I know have an IPhone and STILL go thou the whole process everytime I get back into my truck. this is really leaving a bad taste to ever buy another garmn and maybe try another company’s…..